I've done it! 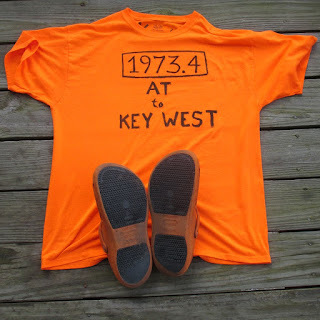 One Hundred Thirty-five days - Appalachian Trail to Key West! I got up this morning and got out my bicycle and rolled it along beside me as I walked the last four miles of the Overseas Heritage Trail, the East Coast Greenway, and the Eastern Continental Trail, and reached the 'Southernmost Point'. There I found a queue of tourists, so I got in line and waited my turn -- the slowest 100 feet of the hike. It took nearly half an hour in line, but then I was officially done my trek. The timing - the number of days it took - is wonderfully symmetrical. It took me exactly twice that - 270 days - to hike the Appalachian Trail both ways in 2012. That was a 2184.2 mile trail. My route from the junction of the Appalachian Trail and the Benton MacKaye trail to the Southernmost Point was 1973.4 miles. Maybe age has slowed me down a little. The orange Bistro Mario Batali edition Crocs that I hiked in are about ready for retirement. They're still as comfortable as footwear can be, but the no-slip tread on the heels is worn through. Time to break out a new pair for the next adventure. 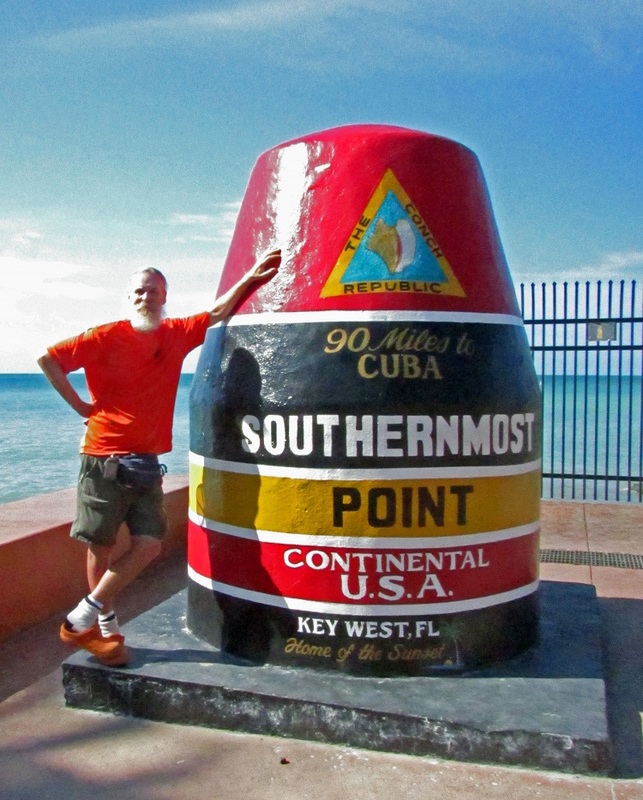 The 'Southernmost Point' is about as artificial as the concrete channel buoy that stands there. 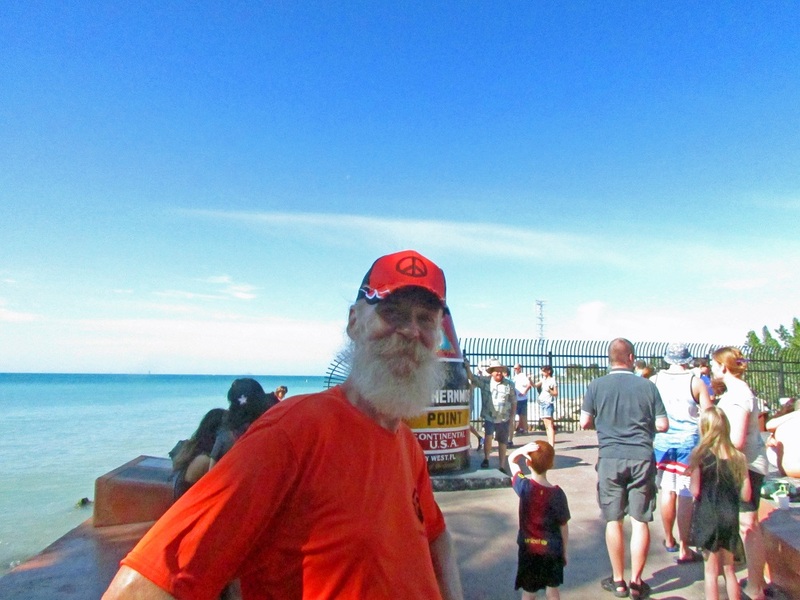 It's not even the southernmost point that a person can walk to from the rest of the US without special permission. That is on the beach at the nearby Fort Zachary Taylor Historic State Park. The actual southernmost point of the island is on the adjacent Navy base and closed to the public. The true southernmost point of land in Florida is either Ballast Key, nine miles west at 24°31′23.0″N, 81°57′51.1″W - a private inhabited island - or Sand Key, six miles southwest of Key West at 24°27′18.3″N, 81°52′37.5″W, where there is a lighthouse and where there once were trees and nesting birds (since washed away, so it now just a sandy shoal). With the hike officially finished I got on my bike and biked the length of Duval St. 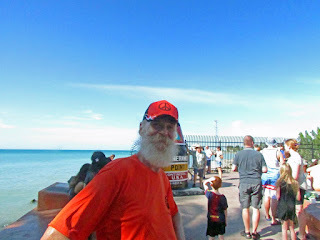 It's a tourist street like those found in many historic downtown areas across the USA. The shops and restaurants have no distinctive Keys 'vibe' or Caribbean feel, and none are as quirky as establishments I've seen in other places. For example Ocracoke, on an island in the Outer Banks along North Carolina's Mountains-to-Sea Trail, comes to mind. If there were any locals at all, they were inside their business establishments catering to the throngs of visitors. The most 'vibe' I got came from this pickup truck, complete with a "Please Assist" (insert money) slot. 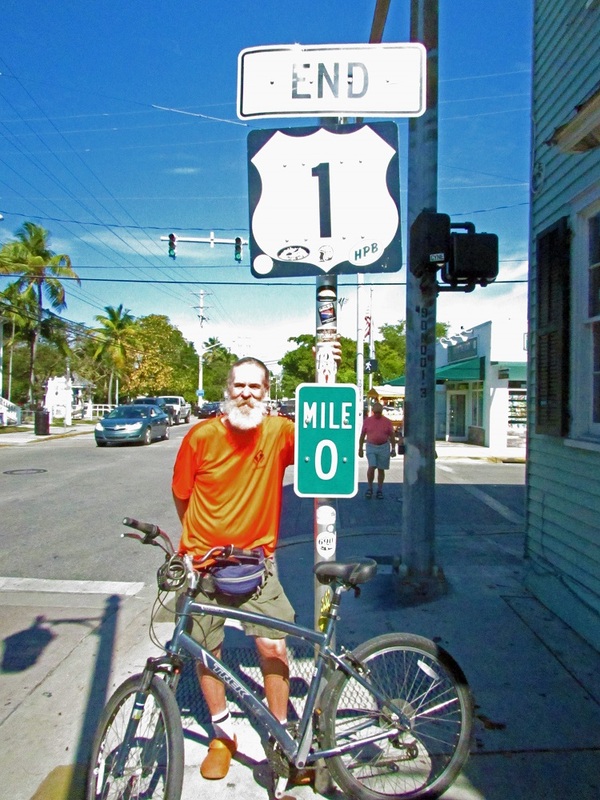 Leaving Duval Street I headed a couple blocks over to the corner of Whitehead and Fleming Streets where US Route 1 officially ends - Mile Marker Zero. I went out to the end of the long concrete pier at Higgs Beach and later captured a decent photo of one of the introduced (and considered to be harmfully invasive) iguanas at Smathers Beach. I didn't take a photo of the free-roaming chickens. They are just ordinary chickens, not distinctive like the diminutive creatures that are so iconic on Kauai. And then the day was done. "Key West and not busted" -- another chapter in 'PJ's book of hiking adventures' complete. On to the next chapter. Here's a map of the final leg of my hike, with link to more photos. PJ, Congrats on completing your amazing journey. Fantastic!